Books: Bible, I Am Invited to a Party! Objective: Jesus is God with us and Jesus is God's Son. Why did God send His son to be born as a baby? Verse: John 14:6 - Jesus said to him, “I am the way, and the truth, and the life. No one comes to the Father except through me." This week introduce the child to God the Son as the second part of the Trinity. 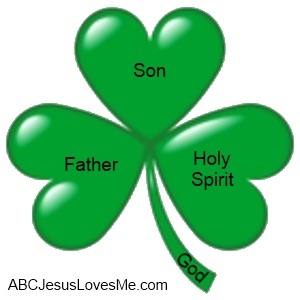 Have the child label the second leaf of the Shamrock "Son." - Jesus is Immanuel which means "God with us." (Isaiah 7:14, Matthew 1:23) God sent His Son to be born as a baby so that we can be forgiven for the sins we have done. - Jesus is Baptized: Use this time to work on colors and fine motor skill by using crayons, colored pencils, or fingerpaint. Run glue along the outline of the Matthew 3:17 Dove worksheet. Place mini marshmallows on the glue lines. May also use dried beans or macaroni to outline. • Comprehension Questions, Memory Verse, Song, Books of the Bible, Sight Word: Because the suggested activities rarely change in these five objectives, they will only be listed in the "Objectives" and not in the "Suggested Activities" portion of the Lesson Plan unless additional information is needed. Continue as suggested. - Using the Drawing Shapes worksheet, work on colors, shapes, and memory. For example: Only saying the directions two times, tell the child "Draw 1 blue triangle." Encourage the child to remember the whole instructions. 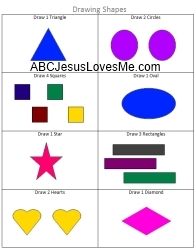 - Precut several shapes and have your child group them together to create different objects. To make this task a little harder, instead of using precut shapes ask your child to draw something using a specific amount of various shapes (i.e. Draw something made of two circles and one rectangle). - To help your child become a better artist, break down the pictures of items into shapes by drawing the shape over the item. For example point out that a house roof is a triangle. A house is a rectangle. A chimney is a rectangle. A tree top is an oval. Once the child is able to see the individual shapes, she will be able to draw more objects. Science: Use jumbo cotton balls to represent the clouds. Dab the cotton ball into a small container of water. Squeeze the water out. Rain! - To make rain sticks tear off one sheet of aluminum foil that is three times as long as a paper towel tube. Roll the foil lengthwise like a snake. Wrap the foil around a wooden spoon creating a spring-like shape. Stretch the foil to be as wide and long as the tube. Place the spring shaped foil into the paper towel tube. 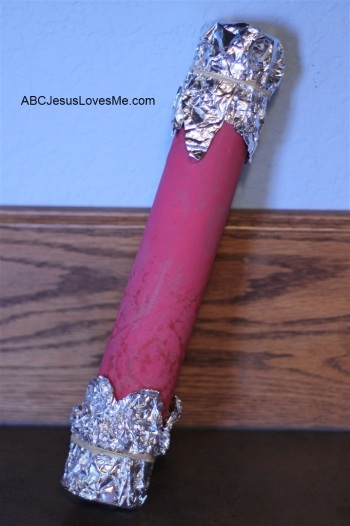 Add a couple of layers of aluminum foil or construction paper to the bottom of the tube to secure the contents. Secure tightly with a rubber band. Add dry beans and/or dry macaroni to the fill the tube 1/10 of the way (make sure that the foil doesn't fall down when pouring in the beans or macaroni). Add a matching cap to the top of the tube. Decorate. Teach the child to tilt the stick slowly. - Songs: "Rain, Rain Go Away," "Itsy Bitsy Spider," "It's Raining, It's Pouring"
- More information and experiments on rain are available at WeatherWizKids.com. - Science: Place ice cubes in a blender. Chop finely to create snow. To make the syrup, stir together 2 cups sugar and 1 cup water in a sauce pan. Bring to a boil and boil 1 minute. Remove from the heat and stir in two .12-15 oz unsweetened powder drink mix (like a Kool-Aid packet). Allow to cool. Pour onto cups of shaved ice. - Make snowflakes by folding a piece of paper in half a few times. 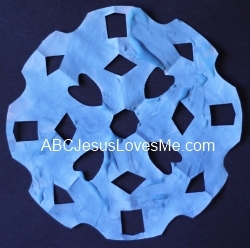 Show the child how to cut small pieces out of the paper to create a snowflake when the paper is unfolded. Add a small photo of the child in the center of the snowflake. 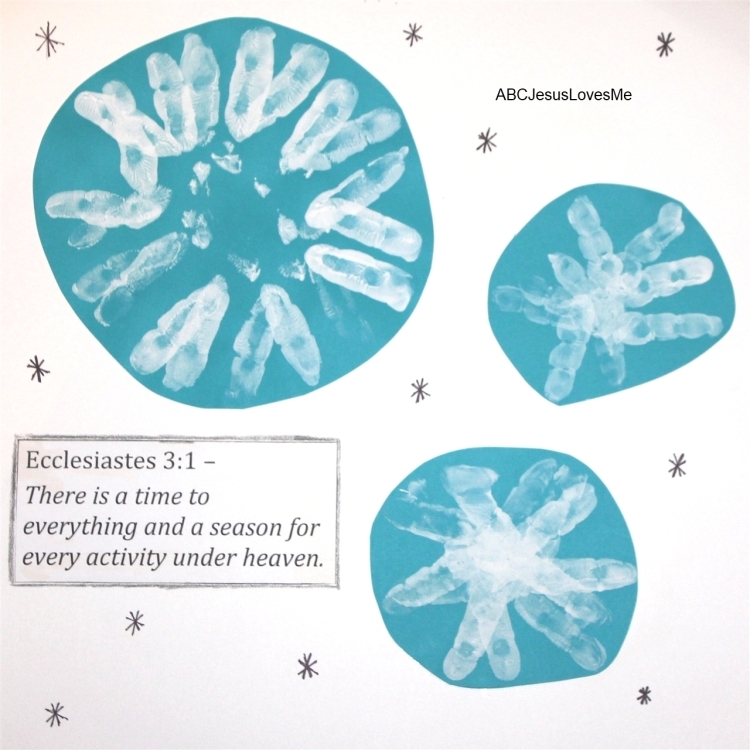 Discuss just how every snowflake is different, God made every person unique and different. - Paint only the index finger of the child's hand. Instruct the child to leave her hand spread. On colored paper, create a circle of lines and then go back over the lines in an "x" formation. Use the Aa Writing worksheet and for further learning check out the Letter A Activities. Write numbers 0-5 on 3/4" Tracing Paper. The author is the person who writes the story or book. An author may be a man, woman, or child. Oftentimes an author writes many books. Mo Williems is a very popular author who has written several series - Pigeon, Knuffle Bunny, Elephant and Piggie, among others. The name of the author is found on the front of the book and on the title page. Some books include information about the author at the beginning or the end of the book. - Have a party and make snow cones (see snow science activity below) . Invite some friends and share this week's book. 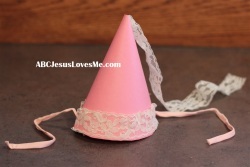 Make party hats together. Cut the Party Hat worksheet. Trace onto cardstock or poster paper. Cut out. Roll and staple together. Towards the bottom, on opposite sides, poke a small hole and insert ribbon to tie around the child’s chin (or use elastic). Tie or staple the ribbon into place. Decorate. Draw What I Draw - With sidewalk chalk, have your child copy what you draw and then reverse. Remember to start with simple lines and progress to simple shapes. Practice kicking a ball. Start with a large ball and progress to a smaller one. Set up a goal and take turns being goalie. Say the names of the month, first five books of the Old Testament, and the memory verse while kicking; say one word per kick. Block Activity - These are activities that we have learned through occupational and visual therapy. Use blocks sets such as Parquetry Block Super Set, Pattern Blocks and Boards, Pattern Blocks to do these activities.